Share this Newsletter in Facebook and Twitter! Donald Trump is seeking to boost defence spending by 10% in his proposed budget plan for 2018. In Nairobi, Actions for GDAMS 2017 are already planned! 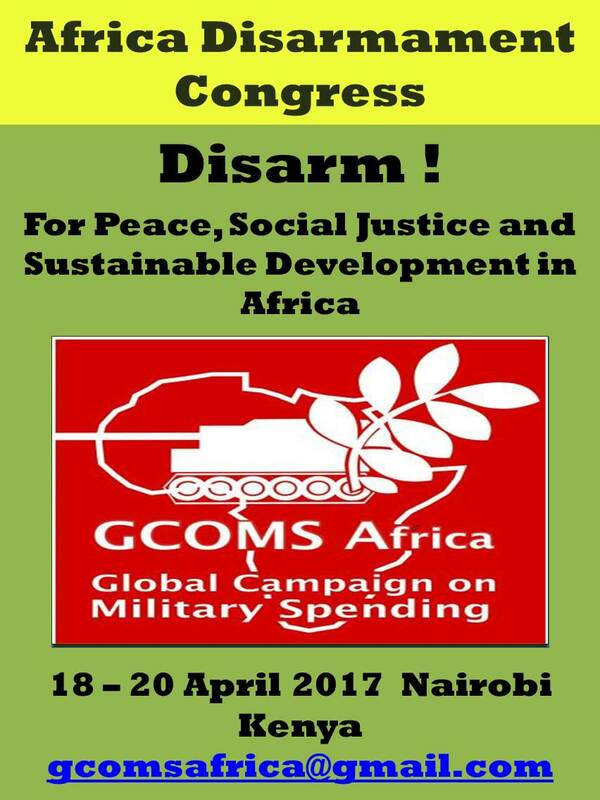 Between April 18th– 20th the Congress “Disarm! For peace, Social Justice and Sustainable Development in Africa” will be held in Kenya. Professor Manas Chatterji from the State University of New York will participate. China will spend “about 1.3 percent” of its gross domestic product on its military this year. This percentage represents an increase of around 7 percent over 2016. On March 6th the Ministry of Finance came up with the total amount of the PLA’s budget, 1.04 trillion yuan ($152 billion). Visit GCOMS U.K. website to have more information! Remember to follow us on Twitter @DemilitarizeDay, like our Facebook page @demilitarizeday, where you will receive all rea-time updates on GCOMS and GDAMS events.